Grace Dental is a dental office that takes pride in presenting their warm and caring environment to their new and existing patients with a broad range of preventative to cosmetic treatments. Their entire atmosphere is intended to be welcoming to clients with an eye to their comfort from the waiting room to the dentist’s chair. Their site was designed to reflect this aspect of their practice. A website like this from Grace Dental is all about relationships with their clients that last a lifetime. The prominence of the slideshow of images reveals that they want their customers to see themselves reflected in the office’s environment right off the bat. This site has a beautifully minimalist design that relies on images over text on the introductory page, leading to excellent information about treatments offered by their practice. Color is an important part of any dental website design, and the blues and whites used in the design of this site were deliberately chosen to give an impression of calm, trust, and professional courtesy all in one package. These color elements can be seen throughout the site, especially where pictures of the staff are present. Less immediately obvious but equally prevalent is the presence of pinks and purples, both of which demonstrate respect and gentleness, desirable traits in any health provider, but especially in dentists. 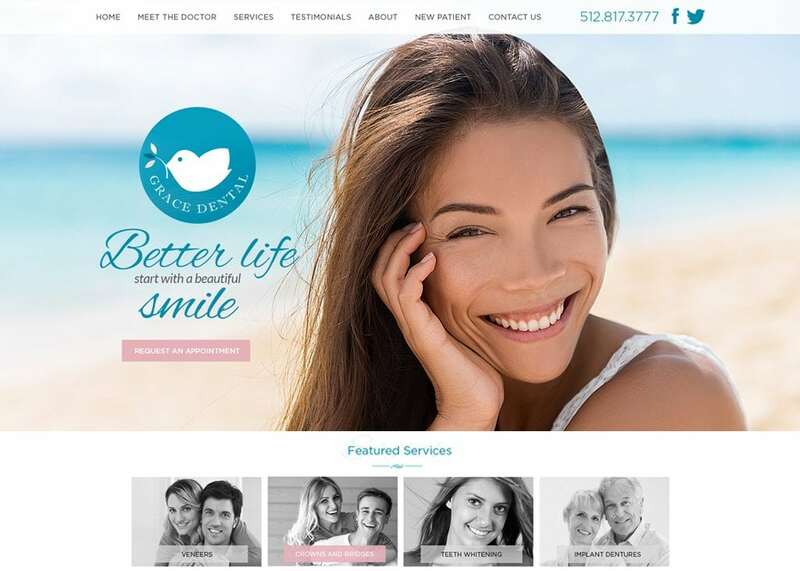 This design makes it clear that this practice is all about people and relationships, the images throughout the site predominantly focusing on whole faces and groups of people over features like teeth and gums. Visitors are intended to stay a while and be brought in by the images and information about the staff that will be serving them, as is apparent by the subtle presence of links found above the initial slideshow presentation. Another subtle undertone in the pages presentation is family oriented services. The imagery found on the website shows a strong preference for groups of people, the only exceptions being those images that focus on bright white smiles on individuals. The overall thought is passed to the visitor is “This would be a great place for us” over “This would be a great place for me.” From new families to those with teenage children, and even couples passing into their twilight years, Grace Dental presents itself as a place for all ages and stages of domestic life. The overall presentation of this website focuses on patient-provider relationships, starting with the sharing of the office philosophy in their “Welcome to Our Clinic” section. Take note of the “Welcome to OUR Clinic” portion, subtle touches like this already start involving the visitor in the conversation and instills a small breath of ownership. The introduction of the physician so early in the site continues this conversation, introducing the site viewer to the staff they’ll be working with and helping them learn a little bit about her. It’s clear from the design that this is the beginning of a long professional relationship with your entire family.